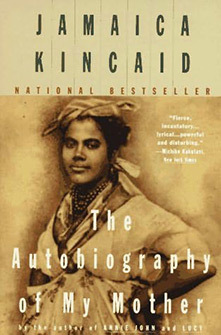 Jamaica Kincaid was born Elaine Potter Richardson, and as a child was greatly influenced by her mother, Annie Richards. At sixteen years of age, after successfully completing a British education in Antigua, she moved to New York as an au pair. After leaving her au pair job, working as a photographer's assistant, and briefly attending college, Richardson changed her name to Jamaica Kincaid and began establishing herself as a writer. After having pieces published in The Village Voice and Ingenue magazine, Kincaid caught the attention of William Shawn, the legendary editor of The New Yorker, which made her staff writer in 1976. In 1983, she published a collection of short fiction, At the Bottom of the River. These stories, which had previously appeared in the New Yorker, won the Morton Dauwen Zabel Award from the American Academy of Arts and Letters. Kincaid's first novel, Annie John (1985), examines a childhood that begins as an idyllic relationship between mother and daughter, a connection that decays through mistrust and misunderstanding until the protagonist leaves her native Antigua. Lucy was published five years later and, in many ways, is thought to be a sequel to her first novel. The protagonist Lucy leaves Antigua, fleeing from her mother to become an au pair in New York. The plot of the novel centers on Lucy's relationship to Mariah, the white woman she works for, and their struggle to understand each other. In a key scene recalling the experience of colonial education, Kincaid presents a critical view of the history of colonization. The Autobiography of My Mother (1997) was the third in Kincaid's series of mother/daughter narratives. It is the story of a young woman, Xuela Claudette Richardson, whose mother dies at birth. The experience of losing one's birth mother becomes a metaphor for the detachment from one's mother country. The novel is a chilling and tight monologue, a haunting expression of the protagonist's isolation, which traces the experiences of Xuela. Kincaid's My Brother (1997) is a departure from her earlier books, in which she explored autobiographical themes in fiction. My Brother tells the story of Devon Drew, Kincaid's youngest brother, who died of acquired immune deficiency syndrome (AIDS) at the age of 33. Like her novels, Kincaid's memoir of her brother's death was praised for its stark honesty and lyrical language. In addition, Kincaid also wrote A Small Place (1988), a book of essays about Antigua. Kincaid's short stories have appeared in the New Yorker, Harper's, Rolling Stone, and The Paris Review. In addition, she has taught creative writing at both Bennington College and Harvard University. Married to the composer Allen Shawn, the son of her New Yorker editor, Kincaid made news in 1995 when she resigned as staff writer of that magazine in protest of the editorial policies of Tina Brown.